In 1950, Grandpa Hummel wanted to move his house.He looked around but could not find a single company that offered the assurance and integrity he was looking for – after all it was his own home he was looking at moving. It was then and there that he decided that he would do it himself. That spirit of dedication to excellence has grown the Hummel House Moving company into a third generation, family owned and operated success story. Now with over 50 years of house moving experience, Hummel is the premier house mover in the Mid-States area. We focus on moving buildings and structures in the tri state area of Southeast South Dakota, Northeast Nebraska, and Northwest Iowa. We specialize in raising and relocating structures of all shapes and sizes, and can help improve your basement and foundation. Just take a look at our photo galleryor read our FAQ section to learn more. We treat your project as our responsibility. We guarantee against structural damage and go above and beyond to maintain the integrity of your building. We are glad to give you a free estimate and have you talk to our satisfied customers. Please contact us today. We are also proud to be part of the world’s largest recycling industry – house moving. 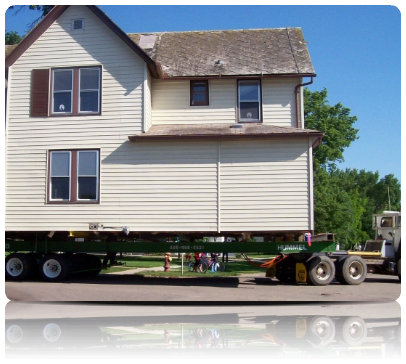 Did you know that instead of demolishing your house or structure, you can move it to another location where it can be put to immediate use? So next time you are thinking about tearing down that old building, remember our motto: “Save a tree, move a house”.